In short, a world of dumb, inanimate objects wakes up to do our bidding. But there are usually more than a few roadblocks between concept and execution. And two of the biggest challenges for the Internet of Things are power and cost. Many of these chips won’t be easily accessible like your smartphone—so batteries in need of daily charging aren’t an ideal option. And if we’re to embed them in potentially billions or tens of billions of things, cost per chip needs to be minimal. For the last few years, researchers and companies have been focused on solving these two problems. And a new generation of Internet of Things chips is emerging. The latest is a battery-free chip the size of an ant that costs a few cents to make. Arbabian’s contribution is an all-in-one chip. Its antennas are about 1/10 the size of a typical WiFi antenna and can send and receive signals. The onboard processor translates and performs incoming instructions. And the most amazing part? No battery required. The chip is powered by the signals it uses to communicate. To be clear, you can only harvest a very small amount of energy from radio waves—but the chip is incredibly power efficient. If it did need a battery, one AAA would run it for a century. But forget Energizer—this thing scavenges light for energy. Arbabian worked with French semiconductor firm STMicroelectronics to make 100 of his chips as a proof-of-concept. He says they were able to pick up signals, harvest energy from them, and obey commands and send out instructions. A potential drawback to the chip is that it only works over short distances. But Arbabian doesn’t think that’s necessarily a problem (in part, no doubt, because of the chip’s low cost). He thinks a web of the devices spaced a meter apart would form an interconnected net of digital control—the neurons of a smart house, for example. 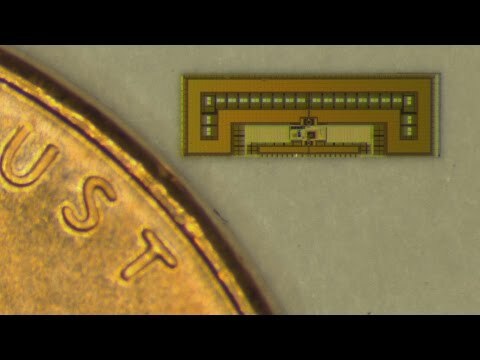 Other groups are also working the same problem from a similar angle, likethis recent battery-free, radio-powered chip out of the University of Washington. The chip breathes the WiFi signals sent between common devices like laptops, smartphones, and the central router. Although it’s currently limited to about 2 meters—the team says they’re working to extend its range to 20 meters. Even as these cheap, low-power, battery-free chips work to enable the Internet of Things—they aren’t the only needed solution. Other challenges lurk down the line, such as building a set of standards that ensures all these smart “things” play nice together, that they work in tandem like a professional symphony instead of your middle school band. And security, too, will be crucial. The last thing you want is a house or city as glitchy with malware and viruses as an early-2000s PC. But first we need the brain. Cheap chips that live on energy harvested out of the air? Worth keeping an eye on. The world isn’t wired yet—but it will be soon enough.